Crime Stoppers encourages members of the community to assist local law enforcement agencies in the fight against crime by overcoming the two key elements that inhibit community involvement: fear and apathy. Crime Stoppers provides sources for providing an anonymous tip by telephone (888-636-9330) or by the website www.racine.crimestoppersweb.com to encourage citizens in the community to volunteer vital information helpful to law enforcement agencies to fight against crime. 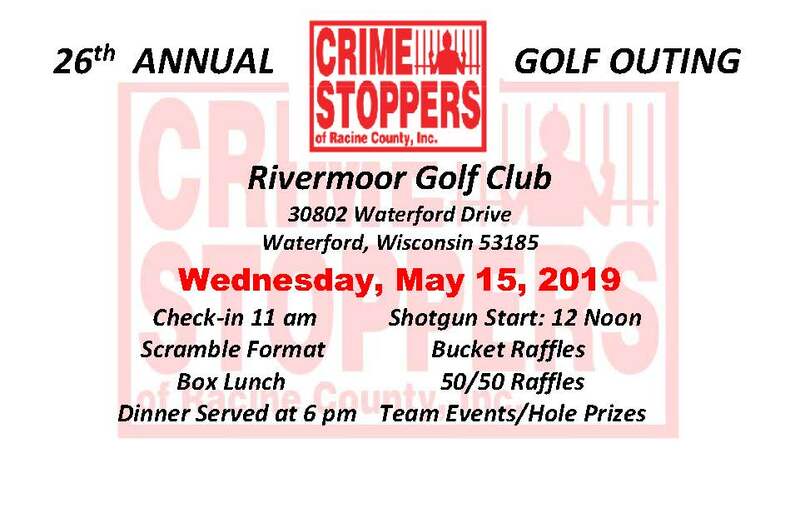 CRIME STOPPERS ANNOUNCES 2019 GOLF OUTING EVENT! We are proud to announce our primary fund raising event, the 26th Annual Golf Outing event. This event is open to everyone which will take place on Wednesday, May 15th with a shotgun start at 12 noon. Personal or Corporate Sponsorship for our golf outing. Donation of $100 toward a hole sponsorship. Participate in our event. You can enter individually or as a foursome. It is a scramble event, so you do not need to be a great golfer! Provide bucket raffle, team or event prizes to help raise much needed funds. Make a monetary donation to Crime Stoppers of Racine County, Inc. - a donation of $10, $20, $25, $50 or even $100 all are greatly appreciated! Our board of directors is an all-volunteer board made up of community and county members, as well as advisors from various Racine County Law Enforcement agencies. We work together to make Racine County a safer place to live and work. If you have any questions about the golf outing or arranging donations to be picked up, you may contact Scott at 262-672-4645. We would be glad to answer your questions. To obtain golf registration forms or to participate as a sponsor, click on our News & Events page to print out the forms you need! Crime Stoppers of Racine County, Inc. is a 501(c)(3) charitable organization and your donation is tax deductible to the fullest extent allowed by law.